In the north of the Caribbean's Lesser Antilles chain lies St. Maarten / Sint Martin, a small territory shared by two cultures, two countries, and thousands of tourists each year. The European capital of the Caribbean, delightfully Dutch and fantastically French, this tiny island of just 36 sq. miles is the smallest country shared by two nations. Excellent winds and blue water seas make for superb sailing and exhilarating open water sailing. Enjoy a relaxing vacation aboard our crewed yacht and discover dozens of sparkling, secluded beaches, while toasting the sunset in one memorable anchorage after another. Aboard our charter you'll visit the beautiful island of St. Barts, an island of high fashion and haute cuisine. For a complete change of pace, we'll sail to Anguilla and give you a chance to experience the Caribbean at its unspoiled best. This pristine island, with its charming villages and stretches of powdery white beach, has a great selection of excellent restaurants. You'll also explore the deserted islands of Prickly Pear Cays, with their dazzling beaches and incomparable snorkeling. St. Maarten is the perfect place for your next sailing vacation. 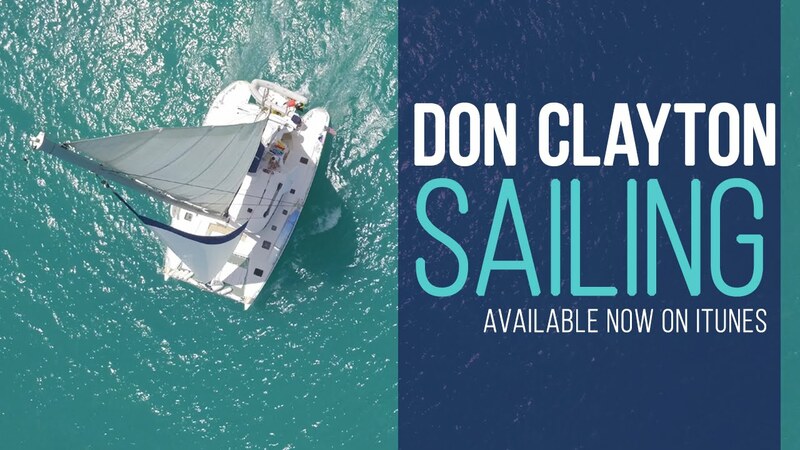 Explore St. Maarten and sail away with the newest music from @DonClaytonSongs. It's the perfect song to get you in the island mood! "Outstanding crew ,one of the best we have had in 5 years...They were very flexible and took us where we wanted to go!" "Our sailing trips with Festiva are truly the best vacations my wife and I have each year." "The meals exceeded our expectations!!! Delicious and healthy and always a beautiful presentation!! One of our guests had dietary restrictions which were cheerfully met at every meal." This small island is located approximately six miles from the Anguillan mainland. It is well known and popular among swimmers and snorkelers looking for a less crowded experience. This beautiful and very secluded cove is perfect for a quiet afternoon on the beach. Marigot, the capital of French St. Martin, is an appealing residential area with brightly colored houses, a scattering of restaurants and lively produce and crafts markets. It’s a great base for exploring St. Martin’s secluded beaches suitable for persons of all ages. Marigot is within easy reach of the famed restaurants at nearby Grand Case, said to have the Caribbean's best dining. Snorkeling on Pinel is known to be the best snorkeling in St. Martin. The snorkel trail is protected by the marine reserve and therefore, have guidelines to follow in order to protect its natural state. Known for its eclectic mix of iguanas, night-blooming cactus, and fabulous beaches, St. Barth's has an array of natural wildlife and Caribbean activities that will help you busy as you scout out for celebrities or shop at the local boutiques. Fly into Princess Juliana International Airport on the Dutch side of the island. Our yacht is located at Porto Cupecoy Marina, just a few moments away from the airport. Taxi service is available from the airport to our home base. You will check-in at the boat which is indicated by the Festiva Sailing Vacations flags and markings. Porto Cupecoy Marina is where our base is located on the Dutch side of St. Maarten which is approximately fifteen minutes from the airport. The meeting time to board the yacht is at 5pm on Saturday. You will have dinner aboard the yacht at the base that evening and the yacht will depart on Sunday morning. Because of crew time needed for provisioning and yacht preparation, no one will be able to board prior to 5pm on Saturday. U.S. citizens must have a valid passport. Other citizens should check entry requirements with their home country's consulate. A $20 tax is imposed upon departure from the Princess Juliana Airport. All guests must bring proof of "onward accommodations" (flight or hotel confirmation for their plans directly after cruise is over). This information will be required if the yacht gets stopped by immigration. The year is flying by, but don't worry, there is still time to book a vacation. Now is the time to choose relaxation over stress, so pull out your calendar and choose your sailing week! This offer is valid for ALL remaining sailing dates for the rest of the year! Plus, it's only $3,495/couple. Choose any remaining available sailing week in 2019. *Based on double occupancy. Offer is not valid on previously made reservations, or in conjunction with other discounts, promotions, packages, member usage or referral pricing. A 50% deposit is required on all reservations outside of 90 days. A 100% deposit is required on all reservations within 90 days of departure. Offer valid for all locations. Valid for any available sailing date in 2019. Offer excludes Christmas and New Years week, Inquire for holiday pricing. Call for details. Call for singles package pricing. Will I be on the catamaran with people I don't know? When you book a stateroom on one of our vessels, we ask that you complete a preference form which outlines the types of activities that you like to participate in and the type of experience you would most like your trip to be. We use this information to combine like guests when at all possible. Our crew are all very in tune with ensuring that individual personalities mesh while on the boat and will do their very best to make certain each guest needs are met. Each of our sailing destinations varies in terms of the types of waters in which you will be sailing. The longest sail that we would do during any one day would be 3-4 hours and this is only in certain sailing destinations. Much of the time we are sailing short distances (30-45 minutes) from point to point, in very well protected waters. We never sail at night and plan our itineraries to be at ideal anchorages well before dark. Because the catamaran has two hulls, the experience is very comfortable with very little motion in the evenings other than a gentle rocking. If you do have tendencies for getting sea sick, our crew can help you with some fool proof remedies they've learned through the years. There are also over the counter medications available that you can bring to help with any motion sickness. How much physical activity is involved in a crewed sailing vacation? Our trips can be best described as light adventure and suited best for those in good physical condition. Because we anchor at night and rarely pull up to docks other than at our base locations, boarding and disembarking the boat is primarily done via dinghy. There is some physical activity and dexterity required in doing this. For a substantial portion of the time, our guests are swimming and climbing in and out of the water from the catamarans swim ladder. The dinghy is used to take guests into shore at the various stops. How should I plan my flight arrangements? Based on your charter destination, plan your flight arrangements according to your charters departure date. For specific details visit the corresponding destination section of this site and click on arrival information. You will board the yacht at 5 pm the first night of your charter and depending on guest arrival times, often we will not sail until the morning following your arrival. You disembark the yacht at 9 am on the last day of your charter. How should we pack for my sailing vacation? When packing, keep in mind that storage space is limited. Soft-sided luggage is required as all luggage will need to be stored in your cabin along with your personal items. Casual and breezy beach attire is certainly the order of the day on deck. Please avoid packing small appliances such as hairdryers and irons as these items will not be necessary. For evening attire slacks or a sundress is appropriate for the nights ashore. Shorts and t-shirts are also fine for dining ashore. While aboard the yacht, no shoes are worn. You will want to have a pair of shoes/flip flops for the night ashore. You may also find aquatic shoes convenient for beachcombing. Be certain to bring along plenty of protection from the sun. Suntan lotion is highly recommended as well as wide-brimmed hats or sailing caps, and loose-fitting cotton cover-ups. A windbreaker jacket is nice to have for cool evenings during certain times of the year and something that is water resistant is also recommended. All bath and beach towels are provided. For more details on how to pack for your sailing vacation, visit our recommended packing list. Will I be able to order special diet menus or request favorite beverages? Once your charter is confirmed, the preference form will ask for specific details relating to your meals and beverages during your charter. Each charter comes with a standard stocked bar featuring liquors, soft drinks, wine and beers that can be provisioned in that specific location. Which meals are not included? The meal plan on the yacht includes 5 dinners, 6 lunches and 7 breakfasts. The night of arrival you will also enjoy a welcome reception with heavy hors d'oeuvres. There are two dinners throughout the week when dining is ashore on your own or as a group. Be certain to plan for these meals. What activities are included in the sailing vacation and which have an additional fee? All the equipment for the aboard activities are provided on the yacht such as sea kayaks, snorkeling fins/masks and swim floats. Your preference form will ask for details specific to your needs. If you are interested in diving while on charter, we can arrange for a local dive company to meet the boat while on charter. The fee would be paid directly to the diving company at the rate of approximately $90-$120 per dive for certified divers (rate and conditions to be confirmed at the time of diving). You will need to have your valid certification card with you to present to the dive operator. What is included onboard the yacht? Just as you would expect in a fine resort hotel, our yachts have all the basic necessities. This includes: bath towels, linens and basic toiletries. It is recommended that you bring your own personal toiletries such as toothpaste, creams and shampoo. Please note that we request that you do not bring spray sunscreen as it creates a slippery deck surface as well as stains. Please bring lotion sunscreen only. We strongly suggest if you bring a hair dryer, bring a low wattage dryer (ie. travel size). Will I be able to make and receive telephone calls or have internet access? Each of our crew is equipped with limited cellular phone service. You can give your family the base telephone number to leave at home in case of emergencies. The base manager will pass on any information to you. In some locations throughout each of our destinations, there will be internet access however it is not a consistent amenity. How much should we tip our crew? Although standard in the charter industry, we sometimes find that guests, especially first-time guests, approach to tipping is occasionally misunderstood. It is customary to tip the captain and crew at the end of the charter. The amount of tip runs in line with the way you would tip at a restaurant with the percentage based on the total amount paid for your charter, or in the case of Cruise Club members or RCI exchangers, the tip should be based on the normal retail charter rate. On average you can expect to tip $600/cabin (good service) - $1,000/cabin (superior service) which would be split between the captain and chef. Crews can accept gratuities in cash or via credit card. All U.S. citizens must have a valid passport. Other citizens should check entry requirements with their home country's consulate. What if the weather forecast prohibits me from my charter? After breakfast we depart through the Dutch Bridge on our way to Road Bay on the British island of Anguilla. We have a leisurely morning sail and lunch at Road Bay after which you will have the opportunity to go ashore and mingle with the locals at Johnos' bar and enjoy the live jazz music, see the locally made sailboats on the beach ready for the next regatta, which is the national sport of Anguilla. Breakfast and we are off to Prickly Pear Cays, a remote uninhabited rocky atoll with amazing bird life and unspoiled lagoon surrounded by a living coral reef. Snorkel to the white powdery beach and over the magnificent coral. You can also explore the water of little bay where schools of small fish totally surround you and you can see the pelicans diving. This area and has been designated as a marine park providing excellent snorkeling and swimming in the azure waters. After lunch we will sail Marigot on the French side of Saint Martin. In the morning you will have an opportunity to go ashore to explore the picturesque town of Marigot, visit fort Luise, enjoy the beautiful mall, and do some shopping in the street market. After lunch we sail to Roche Creol to do some snorkeling, after that we will enter Anse Marsel marina, while the crew is filling the water tanks you will have an opportunity to walk the grounds of the Radisson Hotel. Upon completion of topping up the water tanks we will motor to Grand Case where you will dine ashore in the gourmet Capital of the Caribbean. After breakfast we head off around the north end of the island into Pinel island (Il. Pinel), here you can go ashore, enjoyed the beach, Beach chairs/umbrellas, beach bars, gift shop, hiking, snorkeling, kayaking. In short Pinel island offers something to everyone. We shall stay at Pinel Island until the next morning. Today we shall sail to Saint Bart’s, On the way after two hours of open ocean sailing we shall stop at Il. Fourche (fork island), this island is the rocky remains of an extinct volcano with nothing but lizards and cactus, we shall spend several hours in this magnificent moonscape surrounding, for those who would like to climb the to the summit there are the most spectacular views, the rest can enjoy the water and snorkeling around. After lunch we sail to bay of Colombier on Saint Bart’s, where we can spend the rest of the day exploring the bay in the kayak, walking on the beach or taking the cliff-path into the next day where the views are stunning. The bay is inaccessible by car and is totally unspoiled. There is also plenty of time for our last snorkeling to see all the varieties of Caribbean fish you could wish for. A short sail in the morning takes us to the beautiful harbour of Gustavia, the capital of Saint Bart’s. This island boasts the gateway homes of many celebrities and magnificent mega-yachts. After exploring the wonderful array of old Caribbean houses and varying French shops, and maybe doing an island tour, enjoy a cocktail at Jimmy Buffett’s “cheeseburger in paradise” café. After lunch we take a leisurely sail back to Porto Cupecoy Marina. Enjoy an exquisite cuisine of your choice ashore tonight.